Continuing the ongoing series of interviews with creative artists working on various aspects of movie and TV productions, it is my pleasure to welcome Mark Steel. In this interview he talks about his path into the art department, the ever-changing landscape of episodic television that balances the cinematic scale with shrinking timelines, the day-to-day responsibilities of an art director on set, the present and potential future of combining visual effects with physical world building, and the place of virtual reality tools in simulated set environments. The second half of the interview is about Mark’s work on recently released “Miss Sloane”, a story that follows a formidable D.C. power-broker played by Jessica Chastain and her fight against the powerful gun lobby. Kirill: Please tell us about yourself, and your path into the art department. Mark: I was born in Vancouver and grew up in Ottawa. I watched a lot of TV when I was a kid. I was into animation and horror which lead to a fascination with make up and special effects. I began reading Fangora magazine and other such publications, which really introduced me to the whole behind-the-scenes world of film. In my last year of high school I was offered a co-op program at a local community cable TV station. There I got to direct all sorts of studio shows, local remote and mobile shoots. I then went to post secondary school at Ryerson in Toronto for Radio and Television Arts. I actually wanted to be a TV director when I graduated. I found myself at the CBC as a stagehand, and began working in set decoration and props. The CBC at the time was in decline, but a lot of the old system of designers, art directors, builders, costumes, FX and all the other trades were still under one roof. It was really a wonderful and sadly broken creative place. I learned a tremendous amount about all the crafts and talents that went into production. I worked on the last two seasons of a popular comedy series called “Kids in the Hall”. It was a highly creative show. We did hundreds of sets a season to be shot as 16mm short films, three camera studio bits, with live audience segments. It was really a master class in pushing the boundaries in television at the time. When I left the CBC, I found that my experience as a set decorator was most in demand. Toronto production was growing, and we had three unions in the city. I did a lot of Canadian TV series and movies of the week for US networks. I found myself working with local and US production designers, and eventually I was asked by a local PD to step in as an art director on a TV series for a Disney cable channel sci-fi series. I have been working primarily as an Art Director for US projects in Toronto although I have been all over Canada and some of the Caribbean. Kirill: What drew you into the film / TV industry, and how has that changed after a few productions? Mark: It’s the best part-time job anyone ever has to start. While I was still in school, I had a friend who was working on film sets as a production assistant. I had an occasion to visit and found that environment to be very appealing. My early years at the CBC was a sort of institutionalized experience that was in the process of dying, as government funding was being stripped away and I really had no future there. 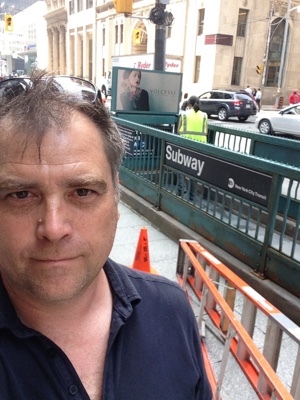 I knew there was this “outside” industry in Toronto, and with a few connections I realized that I could make a living in the art department as a Set Decorator. As a young person, I was very into the circus of it all. Rolling onto locations, completely taking over a space, transforming it and disappearing again without a trace. What I also began to realize very early was that I really didn’t have the patience to work on set with the shooting crew. I found the pace and the hierarchal nature of a film set to be tedious. I much preferred to take part in the research, sourcing, prep and installation of sets. I excelled as a Leadman and Set Decorator and began to build my brand off-set in the Art Department. Kirill: As you have done a variety of both feature and episodic productions, how would you compare the pace of the two worlds? Mark: They are really not that fundamentally different, especially these days. I developed my skills primarily in TV series where mastering scheduling was key. My training and the goals of my early mentors was to create “feature” quality look in spite of budget and schedule constraints. Progressively, the quality and demand of television series increased through the late 2000’s. At the same time many productions also demanded more for less. I can’t say when it was exactly over that period of time that I honed the ability to deliver on shorter and shorter timelines. 8 weeks of prep became 6 weeks that became 4 and so on, but the principal tool constantly employed is communication. It is all about prioritizing the creative needs and getting to consensus as efficiently and respectfully as possible. In TV that is almost always the Producer’s call. In features it is the Director’s. On a TV series most of the time the Director is a guest. Usually he or she has the experience with the format and understands how to efficiently get what is needed out of a shooting day. My contact with the Director is typically about problem solving around scheduling constraints and to guide them through the possibilities on standing sets. Although schedule remains a reality in the feature world as well, the priorities are driven by the Director’s vision. Depending on his / her status and the budget, greater degrees of deference must be payed. Expectations are infinitely scalable, but in the end every project has many of the same steps. Kirill: On a related note, what are your thoughts on what is happening in the world of episodic television in the last few years? As a viewer, quite a few of those shows feel at the level of mid-budget feature drama that used to be done for the big screen. Mark: We are in the age of episodic cinema, in aspiration if not always in practice. I have had the privilege recently to work on a major sci-fi series for CBS. Our approach from the get-go was to design to a cinematic scale. It was a uniquely challenging project, but also in many ways it is the new normal. As streaming moves to take the place of traditional episodic broadcast delivery, I think that we will see a new scheduling paradigm. For a long time air dates drove the pace of production. We are now looking at delivering entire seasons at once, which allows for various ways of deconstructing an episodic series arc and investing in higher production value. However, it always comes down to having all the scripts up front to really pull it off. Everybody has the Game of Thrones in their hearts and minds these days. Kirill: How does it feel when you work on a production, and you see the sets that you’ve worked on getting torn down at the end of it? Mark: I am not overly sentimental. In fact I am usually so focused on the next set that I often forget to photograph my work! There are shows and certain sets that stand out for the exceptional fun or struggle to achieve them. Kirill: Looking back at the work you did a few years ago, what stays with you after some time has passed? Mark: People I have worked with. Kirill: If somebody at a party asks what you do for a living, what’s your answer for somebody who doesn’t work in the industry and doesn’t know the particular intricacies of the art department? Mark: It’s rare that someone stays interested for more than a few polite minutes when I get into the intricacies of my job! Kirill: Are there any common misconceptions that you think people have about what it is that the art department does? Mark: I think to the layman it sounds kind of general and exotic. People think it’s a job where they can be free to express their vision or flair or whatever. In reality it takes a great deal of discipline and skill to really excel. Creativity under pressure isn’t suited to everyone. Kirill: Talking about your work on “Miss Sloane” in that context, is the scope of what you do any different on a production set in the modern days? Mark: It was an attempt to create a version of Washington’s elite corporate world in Toronto. A great deal of effort was made to find interiors that had the right look and feel, and then carefully augment them with elements that made the audience subtly aware that we were in Washington. It was really an exercise in restraint. A story set in contemporary time has the advantage of opening up locations and resources when your schedule and budget his tighter. Kirill: If you look at all the sets that needed to be built on that film, how much of that work happened in pre-production, and how much was completed while the shooting was already under way? Mark: Due to the funding model, we were prohibited for building in a studio. So the first firm Ms. Sloane works at was rework of a recently vacated floor of a fully functioning office building. We had a 10-day run up to shooting to install all the elements that were needed to match another space in another building downtown, because that building couldn’t grant us enough shooting time to complete all the required scenes. We scouted all of our locations a week or two in advance in order to measure and draw up 3D models of the spaces. We then prebuilt and pre-finished as much as possible in the shop. In the case of the Cole Kravitz boardroom set, we installed it for day one of the first five days of the schedule while we set up for scenes in other parts of the building that played for different locations. That was our head start. The remaining sets were delivered on location throughout the shooting schedule with fairly narrow windows most of the time, as they were functioning businesses, schools and government offices. The principal location strategy under those circumstances is to find multiple uses in any given location so that we can prep and shoot during the same block of time. Kirill: Once the shooting starts, what is your typical day or a typical week look like? Is there a moment where you can take a break in the middle of it? Mark: I will start at call time to open set with the director and the crew. That can be very early. Then it’s back to the office to supervise the varying design processes – set design, graphic design, etc. We have meetings with the Production Designer and department heads. TV series have a cycle of such meetings. We talk about concepts on the latest script, special effects, stunts, location scouting, scheduling with the Assistant Directors. The second thing after opening set is usually visiting the shop to check in on build / install progress. You also find some desk time to do budgeting or scheduling. It is usually a 12 to 14 hour day all included, and in the middle you try to take a half-hour break for lunch. Kirill: How important is it for you to surround your actors with complete sets, even if some of that physicality is never going to be captured by the camera? Mark: Very important. Whenever possible we always try to create an immersive environment for the actors. Right down to what is in the desk drawers that only they will see if they choose to open them. Kirill: And on the other hand, your other hat is to fit everything into the budget that you have. How much of what we see in “Miss Sloane” is a surface-deep illusion, if you will, that is captured by the camera from just the right angle to create the impression of a fully-built environment? Mark: A great deal, and my hat is off to John Madden the director. Not only was he a joy to work with, but he brought such a depth of experience and knowledge to each location that he could frame exactly what he needed. There are many sequences in “Miss Sloane” where he and Sebastian Blenkov the cinematographer moved characters flawlessly through multiple locations and sets as though they where one. It was really a thrill to watch the final cut. Kirill: As the story alternates between the two rival law consulting firms with two vastly different budgets at their disposal, how did you embed that difference into their sets? Mark: We chose locations that we felt reflected the politics of the two organizations. Cole Kravitz was more of a K street old boys firm. We used one of the bank towers in Toronto that had some great lobbies and boardrooms that we could convert into big executive offices. We transported some of the glass, marble and wood finishes to another location in our schedule to complete that world. The outer and inner offices were actually two separate locations. The connective tissue is the frosted glass door. Peterson-Wyatt was a modern office furniture showroom that we felt represented the youthful, more liberal politics of the firm. We did a number of stylized murals depicting iconic Washington landmarks to subtly reference the setting. We also tried to brand the space with a logo and colour scheme that complemented the style and design of the furnishings. In the end, I think we were successful in creating a distinctive contrast between the two spaces. Kirill: What can you tell us about the courtroom set? Mark: That was a feat of scenic magic. 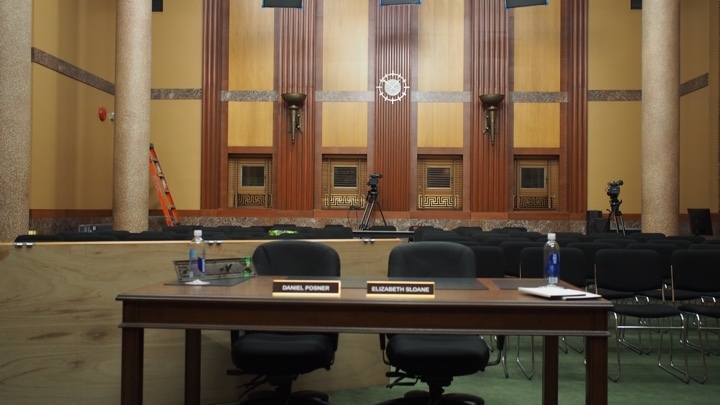 The Hearing Room was a location on a university campus with a great deal of access restriction. We had 3 weeks to build and pre-finish the desk, dais and large wall flats in the shop. All the parts had to be broken down to fit though a 6′ wide set of double doors at the location. The largest elements were pushing 20′ tall after they were assembled. We were also prohibited from fastening directly into any of the walls or ceilings in that space. We used small scaffolds and spreader bars to create structure to support the scenery. All of the installation had to happen over 6 non-consecutive days to accommodate an exam schedule. It is truly a testament to the skill and cooperation of all the departments, but particularly construction and paint, for their dedication and patience. 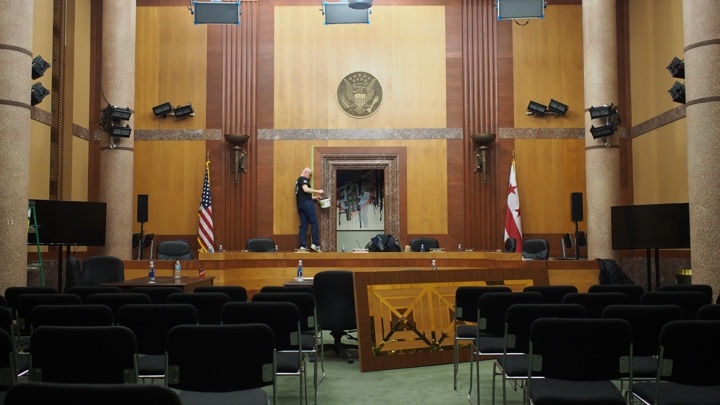 Transforming an existing location to the Hearing Room set – before the work has begun. Courtesy of Mark Steel. 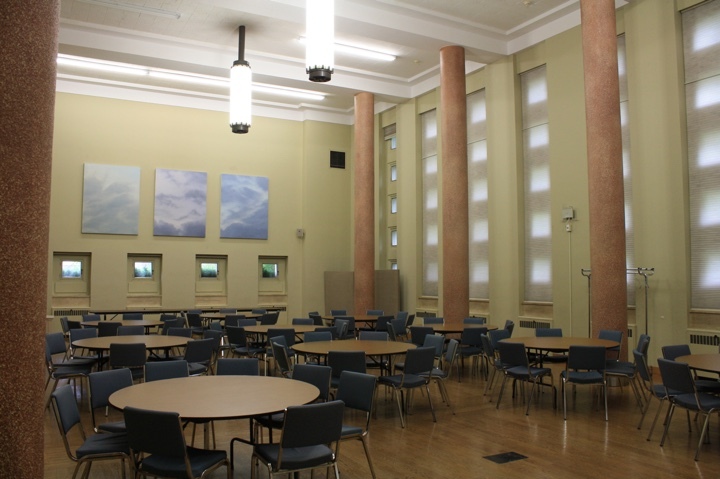 The school had some challenges pinpointing some of the scheduled use of the hall during our installation. So we had a couple of moments when we had to make way while a french horn or a piano recital was held in the middle of our build! The corridor leading to the Hearing Room was a match to another building with a very distinctive polished marble wall finish. We were able to reproduce the finish photographically and print it on adhesive vinyl applied to flats outside the hearing room doors. Kirill: And then, apart from the major recurring sets, you also have quite a few sets that only appear once or twice. What’s your approach to those as far as the level of detail and the amount of time that is spent on those sets to maintain the visual consistency throughout the whole production? Mark: “Miss Sloane” was a small movie with a lot of sets. We had a 36 day shooting schedule to cover 65 sets. We were often moving twice or more in a day. Again, working with a very experienced and talented director like John was key. We would often collaborate on what shots were needed, and focus our time and resources on servicing those needs. That said, it often came down to the talents of our Set Decorator Peter Nicolakakos to provide the perfect singular element to add to the frame to support the character. It really is a team effort. 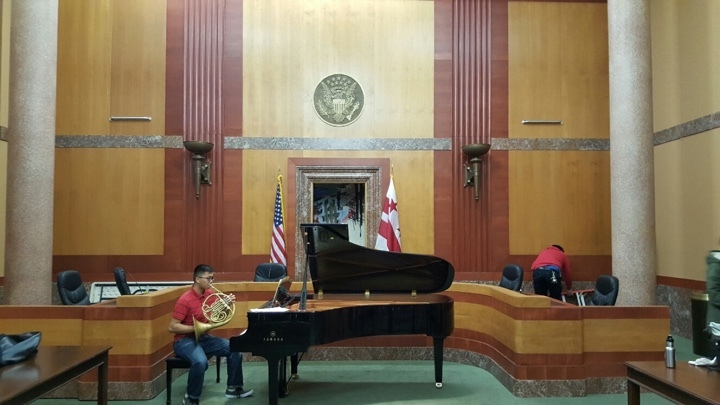 Transforming an existing location to the Hearing Room set – work in progress. Courtesy of Mark Steel. Kirill: How much of the daily cuts do you get to see? How does it feel to see your work in the final cut after color grading, editing, sound and all the other layers added after the main shooting phase is done? Mark: Less so on a feature but often on TV series. It is always a mixed blessing. More often you are validated for your efforts and you get to see a great deal of your work covered. But there are times where none of it makes it in at all! I don’t get too upset when that happens. When a big TV series gets rolling we can often be servicing 4 directors at a time prepping, shooting, and reshooting pieces from multiple episodes. Sometimes what you start out trying to do gets passed through several hands and ideas. Sometimes they choose the worst take on the badly aged edge of the door but it’s the best performance. Can’t win ’em all! Kirill: On a related note, are you worried about the capabilities of CG / VFX to build complete virtual sets around actors in post-production? Will there always be place for that physicality of sets in film and TV? Mark: I am not worried. CG / VFX has grown to be more and more ubiquitous in production, especially in much of the genre I have been working in lately. I think the use of virtual sets is still far from being cost effective to producers. Incorporating the virtual in our design process has, if anything, created more work for the art department. Pre-visualization and illustration have become vital to maintaining the influence on production design through post. More and more we are providing the virtual guide for VFX. As more producers and directors embrace the use of VFX, there is a parallel increase in that workforce and their rates, which in turn creates an increased financial tension between the physical and virtual. It is a big part of my job to measure and broker the use of physical versus virtual scenery. Often the ask is to emulate a sequence from a $300M VFX-driven Marvel feature on an 8 week post schedule. Most of the time we come up with a hybrid solution for performance or channel resources into one or two key uses in order to save VFX money. That all being said, we are beginning to enter the era of virtual and augmented reality. I think all these technologies have exciting potential to assist design. I have been involved in integrating VR into set modeling for pre-vis. There very well may come a time when we are able to simulate enough of an environment that we can replace the need for physical sets. Kirill: What do you do between your productions? Mark: I try to relax and focus on my family, travel and recharging. When I am working I tend to get fairly immersed in a project, which skews the life-work balance. Kirill: What keeps you going and staying in this field? Mark: The challenge and the people. I derive a great deal of satisfaction in untangling and executing the creative process in collaboration with talented and fascinating people. I really don’t see myself anywhere else but in this business. I am a lifer. And here I’d like to thank Mark Steel for graciously agreeing to answer a few questions I had on the craft of art direction and on what went into creating the worlds of “Miss Sloane”, and for sharing images from the sets. “Miss Sloane” is out now on BluRay and other physical and digital formats. Finally, if you want to know more about how films and TV shows are made, click here for additional in-depth interviews in this series. Stay tuned for more interviews in the near future!